I really enjoyed this mod in Oldrim so I had to install this for SSE. Unfortunately, there must be a conflict somewhere, as I had to uninstall this because NPCs would refuse to return to their routines afterwards. I noticed this after I noticed that Belethor stopped opening his shop 24/7. Does nobody at all EVER bother with reading documentation OR the stickies literally sitting right over their heads when they post? Is it true that Bethesda patched out Vampire attacks in cities a couple of months ago? Wondering if this mod might not be as essential as it once was if that's the case, dragons don't generally attack cities very often do they? Yes, they patched out vampire attacks on cities. Except for the one with the random traveler and that was probably because you have to get near him to set him off. The others could happen entirely out of view. Dragons are still very much a threat though. They can attack any city, town, village, or whatever just as they always have. Well I've been playing survival with no mods for a couple of weeks and they're definitely gone, don't think I've ever come across this random traveller. I'm starting to realise just how much I haven't come across though now I can't fast travel, surprising just how many people want you dead out there, and really adds to the challenge just getting from a to b. It's quite a thrill actually I'm finding, especially early on, I walked from Whiterun to High Hrothgar, took two days to get there with a couple of distractions along the way, had crippling brown rot, ataxia, was freezing to death and getting my face smashed in by that frost troll half way up, it was the most alive I've ever felt in skyrim, then realising there was nowhere to sleep and no shrine to cure myself when I got there half dead, I ran back to whiterun with my tail between my legs. You download so many mods without truly knowing what the game has to offer on its own, that you don't know what is vanilla and what's mod half the time, but I'm really noticing things that you've fixed that I had no idea you'd fixed, like vegetable soup and Venison stew not having working health regen, they really haven't fixed things like that after all these years, amazing. Some things are helping though, like I think you might have made changes to a lot of barrels that usually marked as stealing, but now I'm able to just take salt from them without stealing, and that's a huge help in survival, especially early on, although you could just steal anyway and that would probably make sense considering and further increase the risk, now I think about it that would be better. Those 2 redguards as well that remain at whiterun gates after the quest is complete, didn't realise you'd fixed that. Stealthiest mods ever you make, don't even know they're working until they're not. You take a lot of s*** from people, and get little thanks, but you're a good guy Arthmoor, fair play to you. Did you fold in the code for When Vampires Attack? 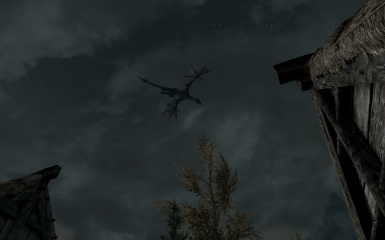 That is, if the city attacks were to resume from a mod, would this pick up on those events (assuming identical to vanilla), or is this still solely dragons? Yep, WVA was folded in. So it will trigger on those events if some mod randomly re-adds them to the game. Though I honestly can't see any good reason to do that since the events are universally unfair other than the random traveler guys. 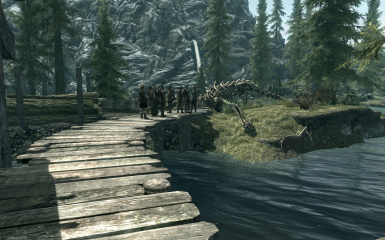 Maybe you could try making the npcs scatter into the woods in case of dragons... just a thought tho, the mod is still better that seeing an npc fighting a dragon with bare fists. 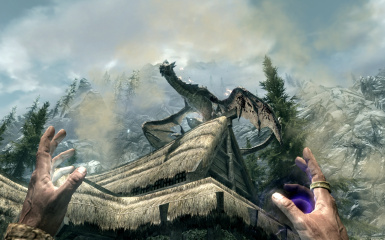 Now that would make sense realistically but as far as Skyrim is concerned, buildings are never actually burned in the dragon attacks we witness (save for the starting scene with Alduin). He simply didn't touch animals with this mod. Correct. I simply didn't cover dealing with animals so their vanilla behavior (or alterations by mods) will take over. IMO it's more realistic as animals panic in random ways, which is what vanilla behavior more or less does. Thank you for responding guys. I personally feel if something like a dragon showed up, an animal's flight or fight response would kick in and they'd run for their life. But thank you for this mod Arthmoor, it's a must have. Endorsed! Can I add this mid playthrough? The only thing I disagree with is members of the College of Winterhold running away from a dragon and leaving me to fight (and die xD) alone.. They shouldn't act as basic defenseless civilians. : :o They're mages, certainly not worse at defending themselves then basic guards. Anyone smarter than me (so everyone) able to verify if the assault system in Deadly Dragons needs a patch for this? What is the BSA file. mods are soo finicky!!! I've added mods to several of my games. so I understand very basic but not all terms. your warning scares me that i'm gonna mess up my game cause i have a lot of mods. i manually download and drop my mods into my mod folder and use nexus mod manager. I do unzip the compressed folder in the mods folder. I don't plan to use a different mod manager this one still seems good. DO NOT extract the contents of the BSA file into your Data folder as loose files, or let your mod manager perform an equivalent function on the contents of the file. Doing so will cause things to load in the wrong order and break the game. Skyrim is intended to load a BSA alongside it's ESM/ESP file. Circumventing this causes issues which I will not provide support for. If you insist on going against this advice, you will receive no support for the problems you generate as a result of this. Except loose files don't fix anything and generally speaking make things a lot worse. And for another mod to be editing a script this mod does would more or less mean someone is doing something shady.